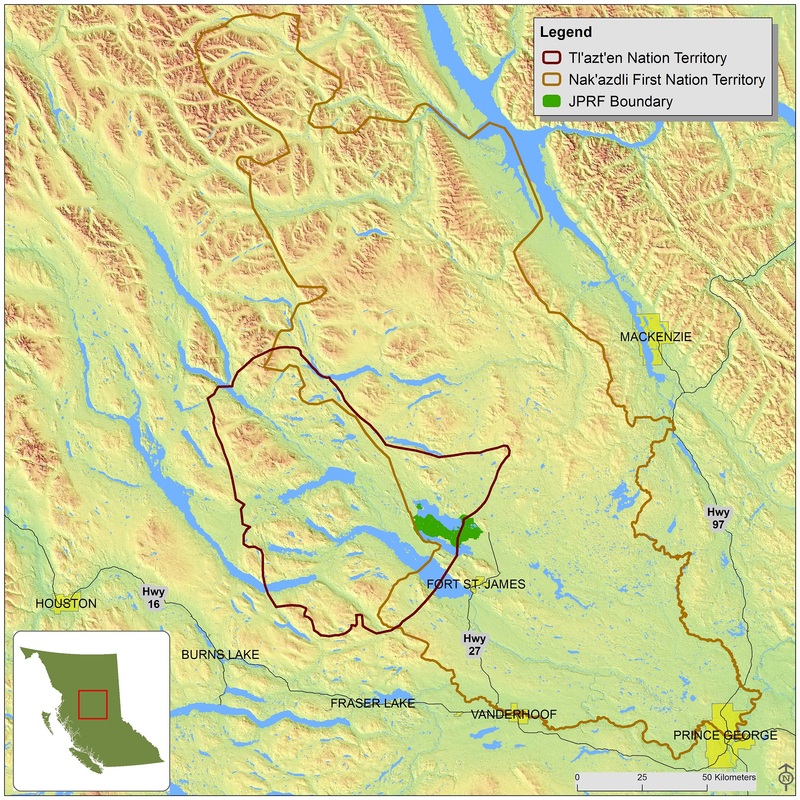 Billed as the largest research forest on the continent, JPRF measures at more than 16 thousand hectares (16,683 ha), equating to more than 35 times the size of Stanley Park in Vancouver. This unique height of land is cradled between Binche Bun (Pinchi Lake) and Chuzghun Bun (Tezzeron Lake), two large lakes exceeding 5000 ha in size. Within the JPFR boundaries, some 303.5 km of streams, 49 small lakes and 2275 ha of wetlands drain into these lakes. 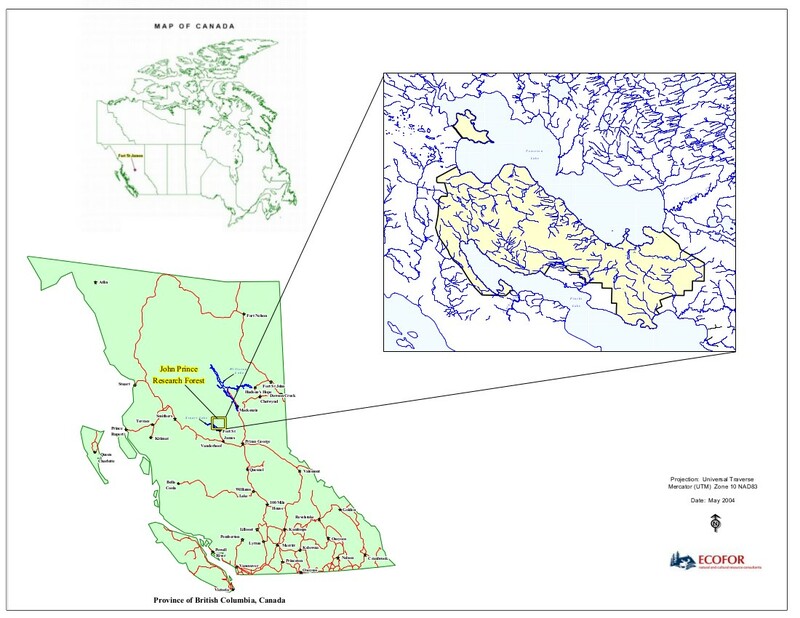 Located in the dry sub-boreal spruce biogeoclimatic zone (SBSdw3) of the Nechako Plateau, the northernmost subdivision of BC’ s Central Interior Plateau, the research forest climate is representative. Exhibiting a continental climate with characteristic extremes o f temperature, summers are short but warm and moist with daytime temperatures that occasionally reach into the 30’s (oC). Winters can be severe with extended periods below -10oC and extremes that can reach -40o C and the area is under snow from November to April, which accumulates to about 1.2 m in depth. Within the SBS zone, the Research Forest tends to be drier and warmer than other subzones. The JPRF falls with the moist interior natural disturbance unit, characterized by large wild fire stand replacement events typically on a 100-200 year cycle. The natural forest types are an uneven-aged mix of Douglas-fir, spruce, pine, subalpine and deciduous types (trembling aspen, black cottonwood and paper birch). These highly productive northern forests have distinctive understories of rose, spirea, soopallie, cranberry, thimbleberry, red osier dogwood, black twinberry, devil’s club and huckleberry varieties. The Pinchi fault runs southeast through the Research Forest, separating the paleozoic (primary limestone) ridge that borders the northeast shores of Pinchi Lake from the Mesozoic bedrock, which forms Pinchi Mountain (falling centrally in the JPRF) and other northeastern intrusions within the Research Forest. The area has a history of timber extraction from 1940s, when fuelwood was cut to supply the Pinchi Mine, a mercury mine bordering the south-central portion of the JPRF. This mine is now decommissioned. Subsequently, a series of small portable mills operated in the area during the 1950s-70s, with active logging especially on the northern portion of the JPRF bordering Tezzeron Lake. 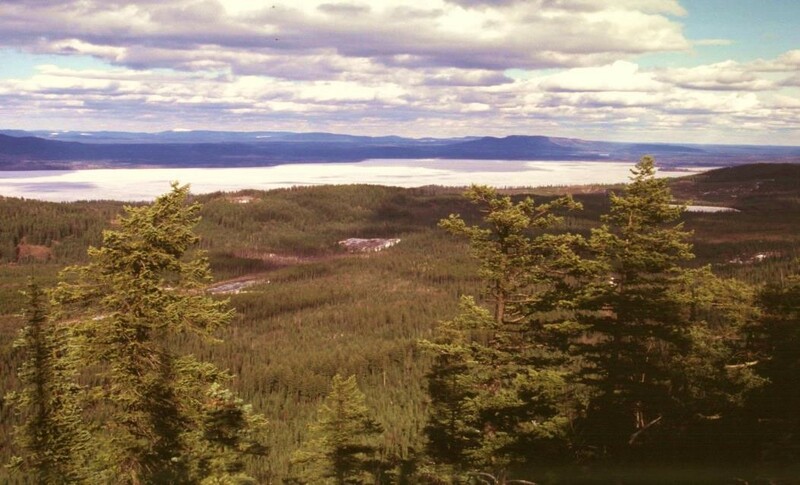 Logging has continued to modern times and the area has a diverse mosaic of various forest management styles as well as a significant portion of old-growth and unmanaged forest types.